First, a very brief history lesson. 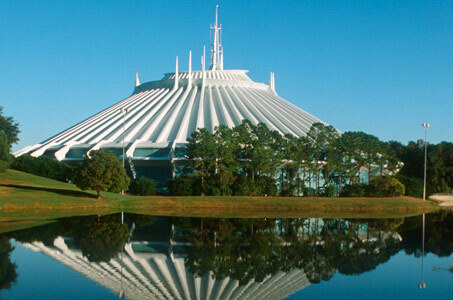 Space Mountain opened in the Magic Kingdom in 1975 and was renovated in 2009. 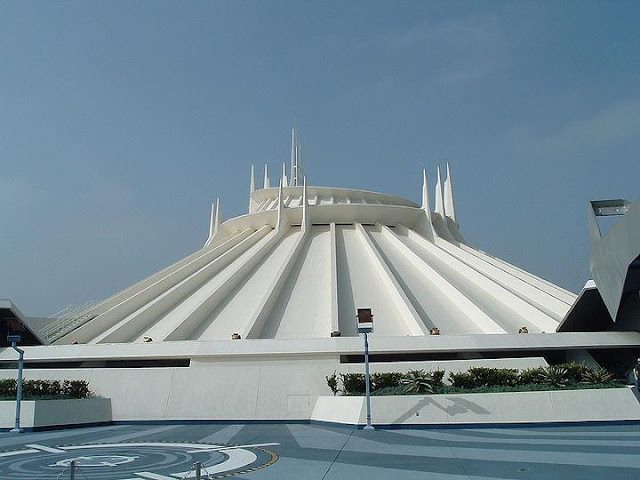 Disneyland's Space Mountain opened in 1977 and was renovated in 2005. Okay, brief history lesson over. Let's ROCK! Let's start with the basics. Both parks sport track layouts unique to themselves, but Magic Kingdom comes in with a one-two punch! That's right, there are two tracks under its dome while Disneyland only has one! 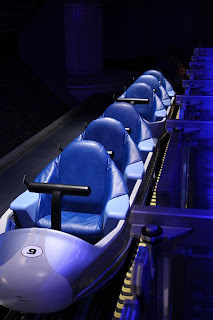 But Disneyland makes a comeback with its two-across seating arrangement instead of Magic Kingdom's single in-line seating. So both parks have essentially the same capacity! A Disneyland Space Mountain train holds twelve people, while a Magic Kingdom train only holds six, but its has twice as many tracks! So far it's a tie! Magic Kingdom's trains. Very Matterhorny. 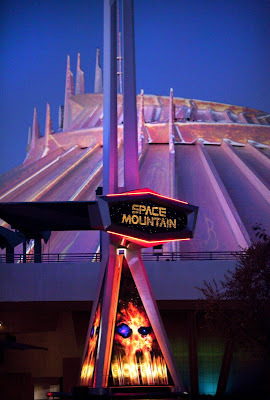 Disneyland's setup. You can slap the person next to you! Music. Music? Music! Both rides feature a pretty good rocking soundtrack while your on the ride. But here's where the Magic Kingdom stumbles. Its music is played through speakers along the ride track, giving it an awkward Doppler effect as you zip through the inky space. Disneyland's sound system is blasting right into your ears from the very seat you're sitting in and is nicely synced to the track itself. Disneyland takes the upper hand! Arrrrghhh!! Kill it with fire! Seriously, Disneyland. Is that all? Nay! Disneyland pulls a rope-a-dope out of nowhere and smashes Magic Kingdom over the head with Ghost Galaxy, its temporary Halloween-time overlay! 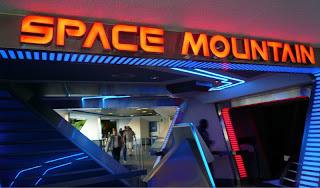 Is Ghost Galaxy better than the normal ride? No, but it's still really damn fun. And it adds some seasonal variety. And makes children cry! Bonus points! with a galactic monster trying to kill you. Disneyland pulls ahead FOR THE WIN!!! 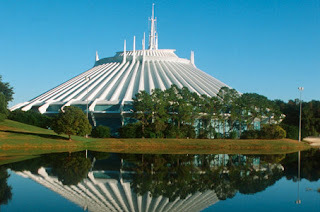 What attractions do you want to see beat the snot out of each other? Let me know in the comments! Awesome- I've been waiting for this! I'm glad you're doing it as a column instead of a one-time "this one's better than that one" post! I'd like to see you do Haunted Mansion, Big Thunder, TSMM, and of course, Pirates. Ah, was it you that gave me this idea in the first place? I couldn't remember. Over time I will move down your list there. This was really fun to write and I'm looking forward to more! But you forgot the biggest point in DL's favor - the type of seat. 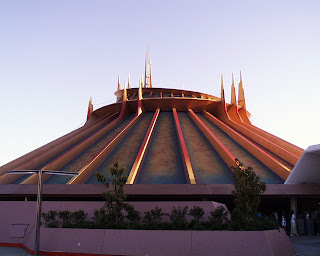 I can get in and out of the ride vehicle in California like a normal person (unlike WDW, where I have a heck of a time getting up off the floor. 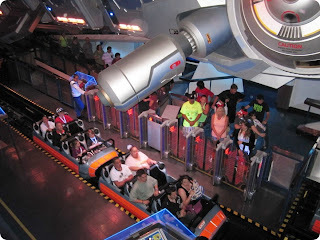 I know they're not exact - but maybe a comparison of Test Track and the new ride in Carsland?? ?